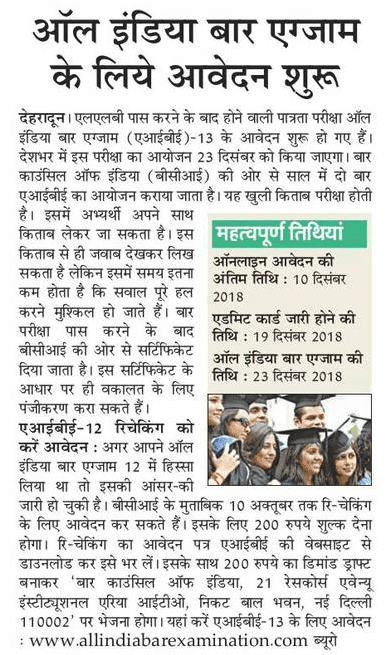 Exam Date Notification for AIBE XIII 2019 has been released as per the notification the AIBE 13 exam has been scheduled on 23 December 2018. In order to appear in said examination have to fill an online application form. All India Bar Examination has started the application procedure for AIBE XIII 2019. Those who are waiting for AIBE 13 Online Application Form 2019 can fill the same by going to the official portal from 26 September 2018 to 10 December 2018. Aspirants must have LLB degree and must be enrolled with State Bar Council. Now take your cursor towards left side of the page and hit on “Registration (AIBE-XIII)” link. Fill the form by providing asked details. Registration number and password will be sent to your email ID. Now go to home page and hit on login button. Thereafter enter registration ID and password for login. Download the challan and pay it on bank. Upload the scanned copy of challan and enter journal number, SBI branch code, date of receipt. Now submit the form and take a print of filled application form for future use.